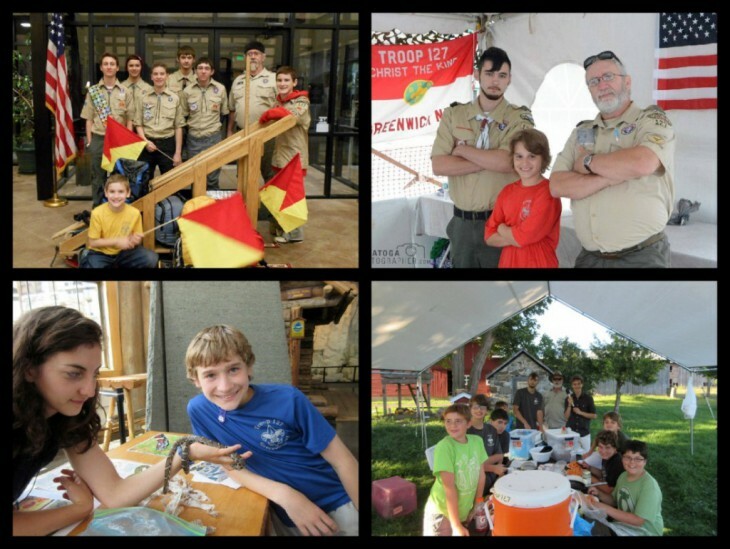 As the Holidays approach, Christ the King Spiritual Life Center's Boy Scout Troop 127 is beginning their annual fundraising events. There are 3 ways you can help support the Troop and ensure another year of outdoor learning in a program that helps youth grow and develop skills in leadership, citizenship and family life. Troop 127 was established in 2008 and recently had its first Eagle Scout Recipient! D'Artagnan Fearon created a beautiful new dock and Pavilion enhancements at the St. Patrick's Pavilion at Christ the King. The Troop has another scout who will complete his Eagle rank before the end of 2015! Noah Heimbach is completing a nest box project that will help the native birds at the Greenwich Rookery. Our Troop's fundraising efforts pay for the many outdoor camping, hiking and canoeing adventures that are a big part of scouting. It also helps pay for each scout's merit badges and ranks earned as well as all the materials and training they need to be successful. Funds are used to offset the cost of Boy Scout Summer Camp that is vital to the program. The Troop is also working on fixing up a small trailer they are making payments on to store and transport their gear. Any contributions to the Troop are greatly appreciated by the scouts and their families. 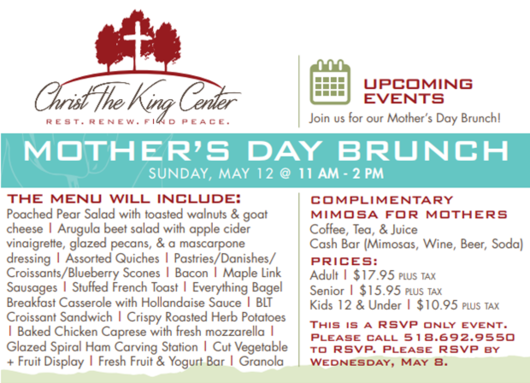 The Troop is dedicated to helping Christ the King Spiritual Life Center grow. They are active as color guard for the closing ceremony of the Welcome Home Initiative, they stock the firewood at the lean-to by the Sacred Heart Lake, they have built benches for the grounds, helped clear trails of debris and worked in the garden. They give back to the community through food drives for the food pantry, volunteering at various community events like the Lion's Club Duathlon in Saratoga and the Tour de Farm in Greenwich to name a few. They will be participating Sept. 19th in the annual Battenkill River Clean-up. The continued growth and success of the Troop can really benefit from your donations and fundraiser purchases. October 26 LAST DAY TO ORDER. 1. Direct Monetary Donations - All monetary donations can be made out to TROOP 127 and mailed to Christ the King Spiritual Life Center. 2. Trail's End Popcorn Sales - Send an email to cfearon@ctkcenter.org with your order. 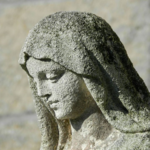 All orders can be picked up at Christ the King Spiritual Life Center on or after November 21st 2015, you will be contacted when your order is ready for pick-up. 3. 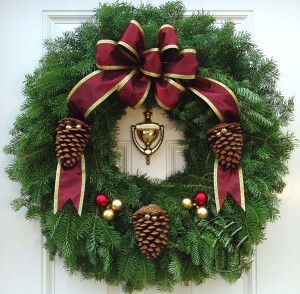 Mickman Wreath Sales - Send an email to cfearon@ctkcenter.org with your order. They arrive at Christ the King Spiritual Life Center between November 9 and 13th, you will be contacted when your order is ready for pick-up. These wreaths etc. will last through the holidays. This is the third year we are selling these beautiful real wreaths, swags, centerpiece and living tree, handmade in Minnesota. 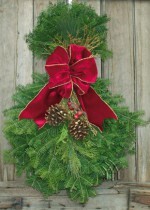 The Victorian Wreath offers a taste of Old World craftsmanship to your Christmas Wreath Fundraiser. Handcrafted from Minnesota Balsam Fir, the Victorian Wreath is trimmed with an exquisite burgundy bow with imprinted wired edges. Natural bronze pine cones accented with gold jingle bells and unbreakable satin finished Christmas Bulb Ornaments complete this enchanting Wreath. 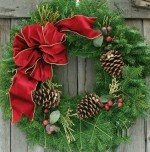 The Victorian Christmas Wreath is 25 inch in diameter. 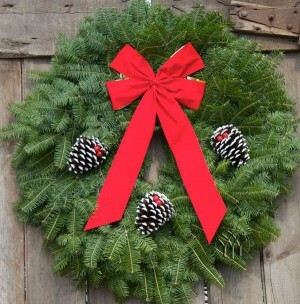 This The Cranberry Splash Christmas Wreath is made from natural Balsam Fir boughs and is decorated with a generous, 4 inch wide fabric bow with gold wired edges. The ornamental trimmings include faux cranberry sprigs and gold juniper twigs. Three natural bronze ponderosa pine cones laced with gold jingle bells set the finishing touches for this stunning addition to any and all Holiday Decoration Themes. 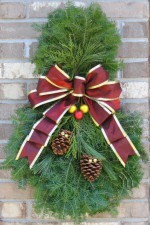 The Cranberry Splash Christmas Wreath is 25 inches. This stylish Centerpiece is bursting with naturally scented mixed evergreens including Frasier Fir, Western Red Cedar and White Pine. The moist floral foam core will keep your centerpiece fresh and thriving throughout the Holiday Season. The seasonal accents of frosted and glittered pine cones and red faux berries add just the right amount of elegant detail to this truly stylish holiday centerpiece. Included is a white, real wax, LED candle that glows to a cozy amber color in low light. Size: About 18 inches wide. This living, table top Christmas Tree is perfect for use where a full size tree is too large: * Children's Rooms * Home Entryways * Office Settings * Elderly Facilities * And more? 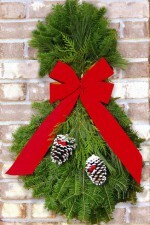 Each tree comes with colorful jingle bell ornaments and a glittery silver star garland as pictured. The LED Christmas Lights add just the right amount of twinkle to the perfect little Christmas Tree! These nursery grown Dwarf Alberta Spruce Trees are about 22 inches tall. They will remain fresh through the Holidays with regular watering as per the care instructions which accompany each tree. These trees can be planted outdoors after the Holidays to enjoy for years to come!